Mini Me Geology Blog » 5 Tips for Summer Science Learning and Fun! 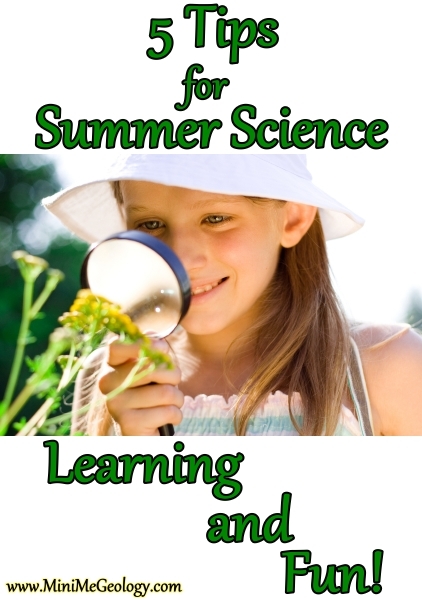 5 Tips for Summer Science Learning and Fun! Summer is on the way and school is almost over. How do we keep our kids learning during these warm months when learning is the last thing on their mind? Ask Questions. Ask your children simple questions as you play during the summer. Why do you think the baseball comes back down after you throw it up in the air? How many legs do you see on the caterpillar? Why do you think that rock has stripes? Help your children look up the answers that they don’t know either in a dictionary or on the computer. Take a Nature Walk. You don’t have to live in the countryside to take a nature walk. Nature is all around you from grass fields to forests, from ball parks to city sidewalks. Walk around the neighborhood with your children and see how many signs of nature you can find. Take a notebook to write about your findings and the animals you see. A small collection bag can be great for holding rock and leaf samples. When you get home, see how many of your samples you can identify using books or computer resources. Visit the Zoo or a Science Museum. Take a trip to the closest zoo or science museum to allow your children to experience science in person. Summer trips can spark new interests in animals, ecosystems or rock types. Have your children take a journal and write about their favorite exhibits. Another great way to continue learning is to have the children write an adventure story about the exhibits that they saw with them as the star scientist! Remember, no matter what you do this summer, science is all around you. Just take a minute to look and enjoy. Visit www.MiniMeGeology.com for more science fun!